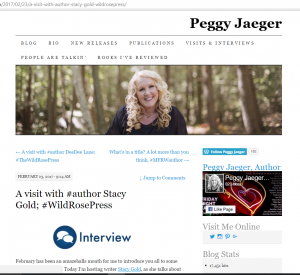 Yesterday, I had the great pleasure of being interviewed on author Peggy Jaegers fantastic blog. Her interview questions were fun, funny, interesting and different. I hope my answers were, too. If you’d like to learn more about me, why I write, what I do for fun, and other stuff you probably hadn’t even thought of yet, check out my interview here.